Some storms could become strong/severe, producing damaging winds and large hail. 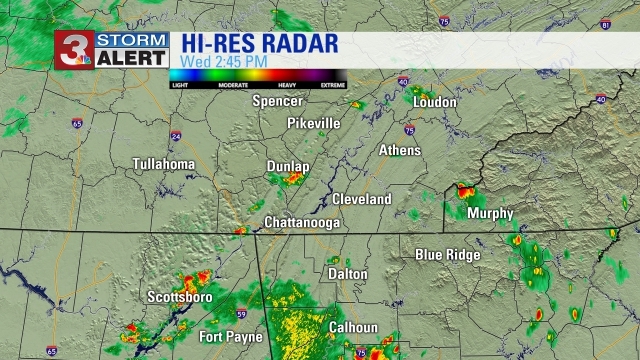 UPDATE: Most of the showers and storms that will move through tonight will be south of Chattanooga and in north Georgia. Some of the storms could become strong to severe. Lows tonight will be near 70. This weekend will be very warm and humid with highs in the upper 80&apos;s to near 90. A few isolated showers or storms could develop, but there will not be as many as we have seen recently. Monday should be quite pleasant with highs in the mid 80&apos;s and mostly sunny skies along with less humidity. Tuesday will see a few more clouds with highs in the low to mid-80&apos;s. Wednesday should be sunny with mid 80&apos;s expected. Thursday and Friday will see the humidity levels rising along with the temperatures into the mid and upper 80&apos;s. A few isolated showers may develop, too.